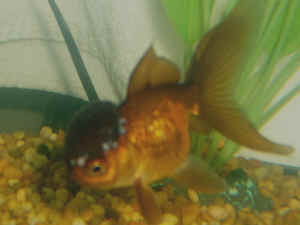 Sick Shubunkin Hi I have a goldfish and a Shubunkin in a 5 gallon tank. the goldfish is fine, thriving and healthy. My poor Shubunkin has been sick for a while and seems to be getting worse. he started off about a month ago with clamped fins and hanging in the top corner of the tank. this went on for some weeks, he was feeding ok at that point. in the last couple of days he seems to have lost some colour and has started to swim only with his tail, all the other fins are clamped.